It’s the end of the day. All of your students have been dismissed. You are exhausted. 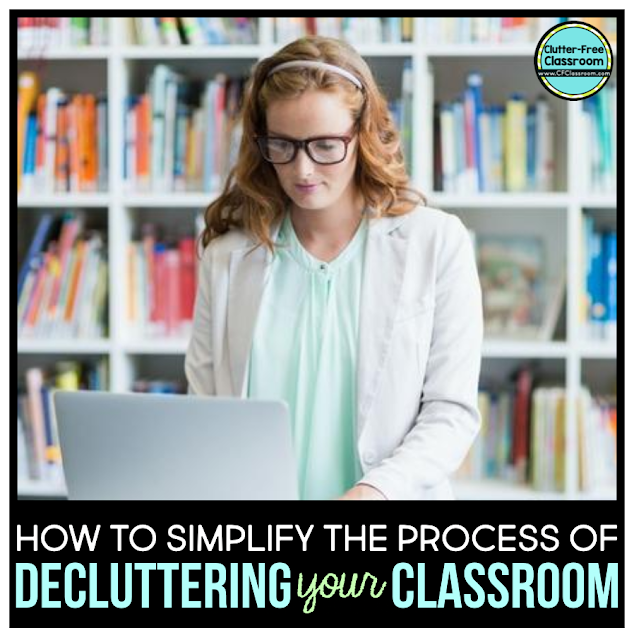 You sit down for a brief moment, take a deep breath, glance up at your room, and see CLUTTER, CLUTTER, and MORE CLUTTER! In your exhaustion, you sit and think about how you need to get rid of all the clutter that is increasing your stress and decreasing your productivity. As you begin thinking about each cluttered area, it is so easy to talk yourself into keeping something. You start daydreaming about what you MIGHT use it for. You think about the fact that you paid money for it, or perhaps invested a lot of time in creating it. I find myself doing this too. Let’s both remember to quickly remind ourselves that holding onto it isn't going to give us back our time or money. Let’s also assign a new value to it. We may have invested X number of dollars into it, but if we are not using it anymore then there is no value. 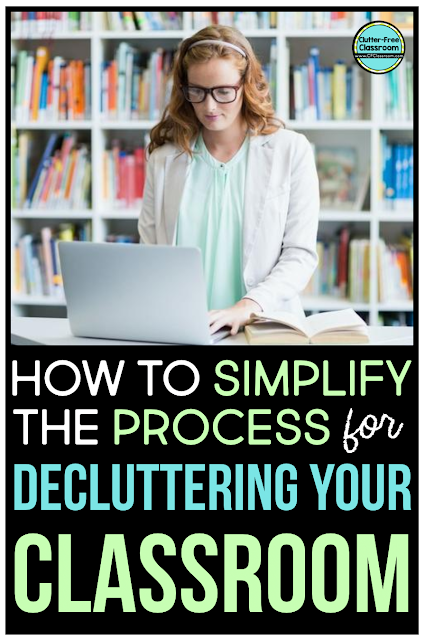 Let’s get started with a plan for where all that clutter is going to go when you begin to purge. When you are purging you will want to move quickly and not overthink your actions. Having a set of non-negotiable rules for escorting an item out of your space will allow you to purge swiftly. Say it with me… It is okay to let things go that no longer serve you. Would somebody else use and appreciate it? If so then it would have more value to them and you can pass it along otherwise it should be trashed, recycled or sold. 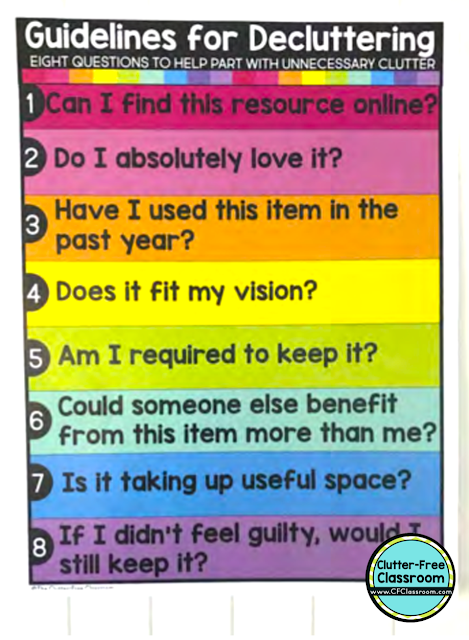 The Classroom Organization Bundle includes a poster to help you. The rules are written in a question format, but I recommend writing your rules as statements when you write them. Write or type your rules for accountability purposes. Keep them in a place where you can refer back to them as needed (e.g. folder on your laptop/computer, notes section of your iPad, or a piece of paper taped to the wall near your desk). Think about rules that align with your belief system and personal goals. Here are examples of rules that I have used: 1) I will throw it away if it is broken. 2) I will recycle it if it is available online. 3) I will donate it if I have not used it in the past year.